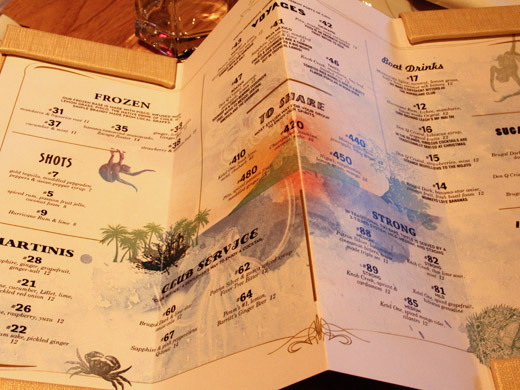 The cocktail menu at the Hurricane Club, the new midtown edition to the ongoing tiki bar craze, is by the numbers. Seriously. Nearly every drink is not named, but numbered. You could order the #31 frozen cocktail (mandarin and liquorice root II) or the #7 shot (gold tequila, muddled peppadew peppers & Asian-pepper syryp). The drinks are divided into categories. There's the expected "Frozen" (all Pisco-based) and "Martinis" (mainly vodka) sections; the seemingly Jimmy Buffett-inspired "Boat Drinks" section; "Voyages" ("Exotic ingredients, inspired by different ports of call"); "In the Shell" (drinks served in coconuts, pepper shells and hollowed-out melons and pineapples; "To Share" ("Most stylish way for your group to enjoy our spirits"); and "Club Service" ("A gentleman's way to enjoy a cocktail"). Not sure how I feel about having cocktails that are just numbered, I feel the naming of the cocktails brings an extra dimension to the experience. Nice to see a selection of pisco-based cocktails on the menu though, its not very popular this side of the atlantic although hopefully people will get to know more about it soon!